Once your kids are skiing all the black diamonds they can find, showing teenage maturity and real respect for the mountains, it might be time to treat the family to a cat ski trip. 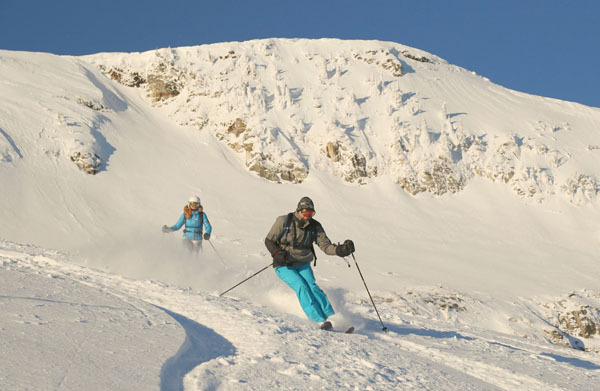 If you are looking for high alpine adventure, untracked powder, in a remote spectacular location, consider a family cat skiing vacation. Similar to Heli skiing, cat ski lodges like Monashee Powder Snowcats deliver fresh powder, a private ski experience, snow soaked tree skiing, fostering a family ski bond like no other. See our Monashee Cat Ski Photos. Monashee Powder Snowcats is the best family owned and operated cat ski operation, 19 years running, in British Columbia, Canada. The Monashee Lodge is in the remote namesake Monashees – Canada’s mountains reputed for great heli-skiing and cat skiing, near Revelstoke and Big White ski resorts. Monashee’s homey cozy Lodge is a mile high at 5,300’, where the super friendly crew, and Carolyn – the owner, reside and welcome guests for 3 or 4 night stays. Guests under 19 require signature of parents or guardian, and you must be a strong intermediate skier at minimum- we’d say expert to appreciate the variable unpredictable terrain and to recognize the avalanche risks, and the beautiful rewards. Warning: if you spoil your kids now with cat skiing, they’ll be hooked and heli-skiing will be next. Monashee cat ski guests are almost all returning, which says a lot about the Guides, the staff, the hospitality and meals at Monashee Powder Snowcats Lodge, and most importantly – the terrain you will ski. There’s nothing fancy about the guests rooms with en suite bath in the attached 3-story Guest Chalet that hosts the 24 skiers and snowboarders each trip, its clean and neat and steps to the Main Lodge. You come here to ski fresh tracks. Our four-day cat ski trip ran like a Swiss watch, up at 7, pack your lunch from the buffet, savor a hearty breakfast while the Guides debrief you on snow stability and where the group will ski that day. Rumbling up the mountain by 8:30 in the sturdy snowcat, guides bring you to spectacular peaks where you ski fresh snowy runs with names like Top of the World, Trapper, Snake Tongues, and Steep & Deep – everything from mellow wide open bowls, to tight snow-loaded trees, and steeps with big pillow tops if your cat group is game for it. Monashee Powder Snowcats typically provide 10-14 runs day, about 15,000’ vertical depending on your group’s ability and speed. This is more skiing than you usually get heli-skiing, for less expense, and it’s all inclusive – three meals daily, lodging and guide services. Guides instruct you on where to ski, and more importantly where not to. Often you spoon the guide and fellow skiers’ tracks. Monashee Powder Snowcats has a 17,000-acre tenure, private powder stashes shared between two snow cats of 12 that alternate terrain each day. Back at Monashee Lodge by 4, skiers hit the two outdoor hot tubs for a soak accompanied by Alpen glow over the Monashee Mountains. The Lodge has a TV game room, and Wi-Fi to post facebook photos to the envy of your friends. Chef’s dinner is served at 7pm, there’s a bar with Okanagan wines and local ales. After dinner, the day’s professional photos are shown on the flat-screen TV downstairs, pictures can be purchased. If you have been wanting to take your family cat skiing, or to try heli ski, we recommend a three or four day stay with Monashee Powder Cats – you’ll get your money’s worth and plenty of epic ski runs – a memorable family ski trip beyond the boundaries of a ski resort. Monashee Powder Cats is in British Columbia, Canada, an hour from Kelowna airport, near Revelstoke and Big White ski resorts if you wish to combine your cat ski trip with some resort skiing before or after.